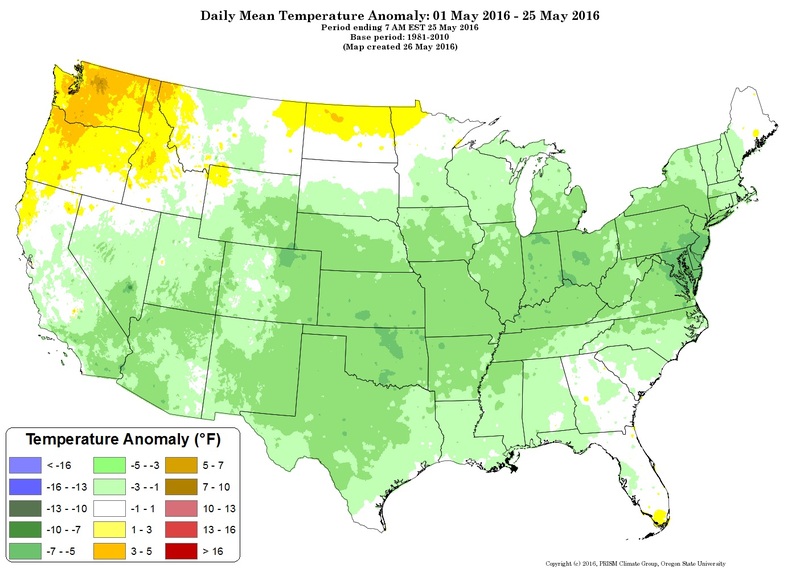 After warmer-than-average temperatures for much of the past year, May suddenly turned cooler across the nation — except for the Northwest, which remained warmer than normal. Although it seemed cool recently, at least compared to April, Western Washington had the greatest deviation with temperatures between 3 and 5 degrees higher than the 30-year average. See first map. The big story earlier this month was that worldwide temperatures had broken all-time heat records for 12 months in a row, and April’s record-high temperature was a full half-degree higher than the previous record. The average temperature hasn’t been below the 20th century average since December 1984, and the last time the Earth broke a monthly cold record was nearly a century ago, in December 1916, according to NOAA records. “These kinds of records may not be that interesting, but so many in a row that break the previous records by so much indicates that we’re entering uncharted climatic territory (for modern human society),” Texas A&M University climate scientist Andrew Dessler wrote in an email to Seth Borenstein of the Associated Press. 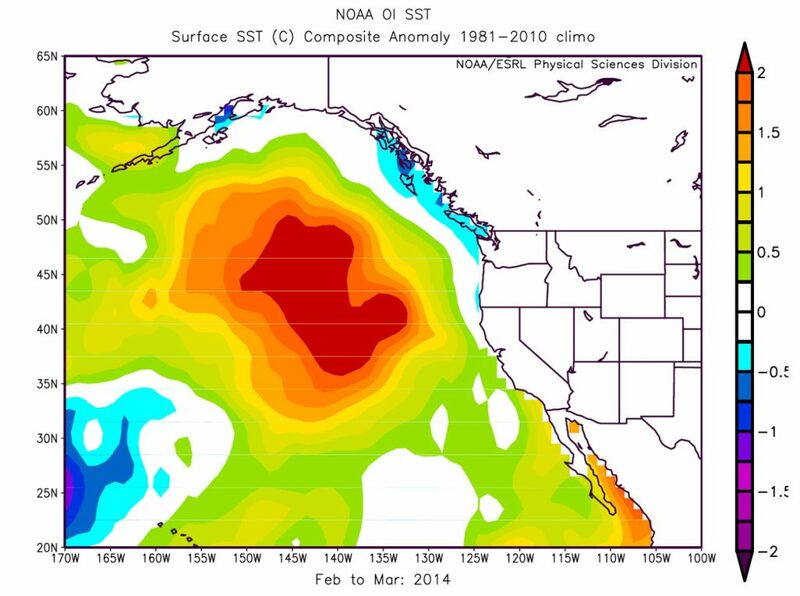 El Niño, which is now fading, was blamed in part for the unprecedented heat worldwide. But climatologists say the onward march of global warming lies in the background. Last year turned out to be the hottest year on record, easily beating 2014, which was also a record year. 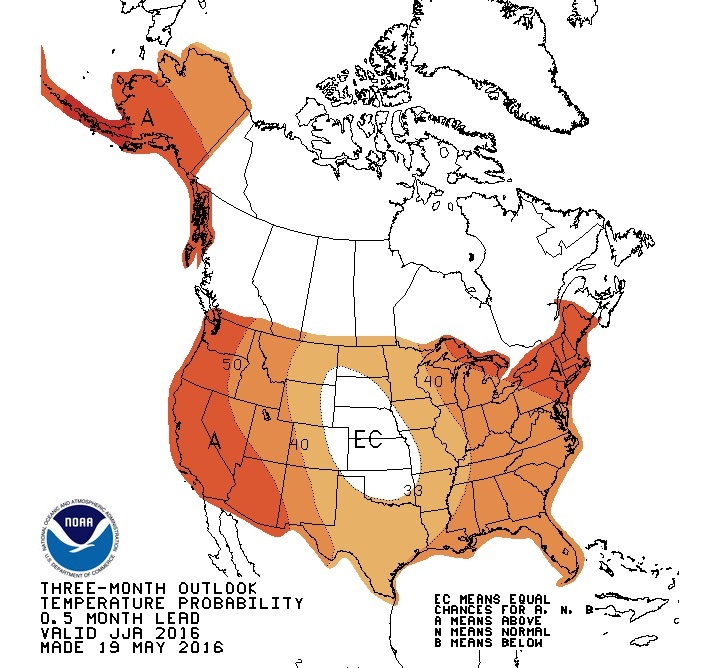 The first four months of this year were so much hotter than 2015 that 2016 is still likely to set another record. NOOA’s Climate Prediction Center says La Niña conditions are on the way, with a 50 percent chance of La Niña by summer and a 75 percent chance by fall. Summer temperatures are expected to be above average except in the Central U.S., while both coasts are expected to be the most likely to exceed normal temperatures. Check out the second map on this page. Speaking of the onward march of climate change, computer graphics developers keep coming up with new ways to show how global temperatures are increasing in concert with rising greenhouse gases in the atmosphere. 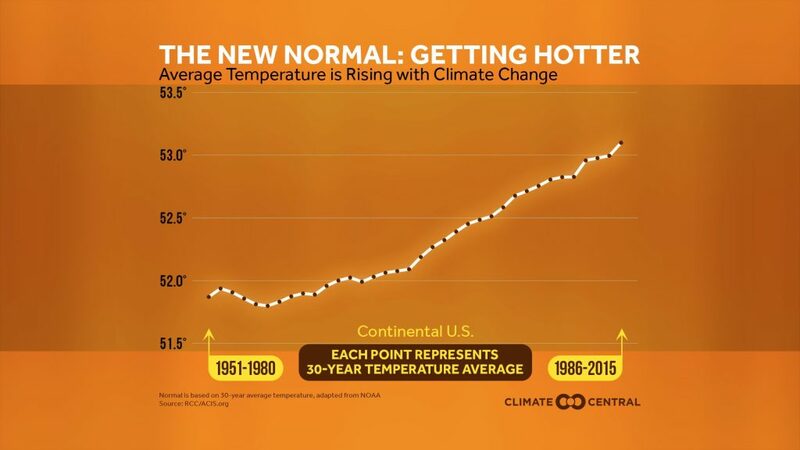 Climate Central has combined data sets from NOAA to produce the orange graph,which shows the advance of a trailing 30-year temperature average from 1980 through 2015. To put it simply, we continue to adjust to a new normal. Others have used animation to depict temperature change. One graphic (below) received a lot of attention this month. 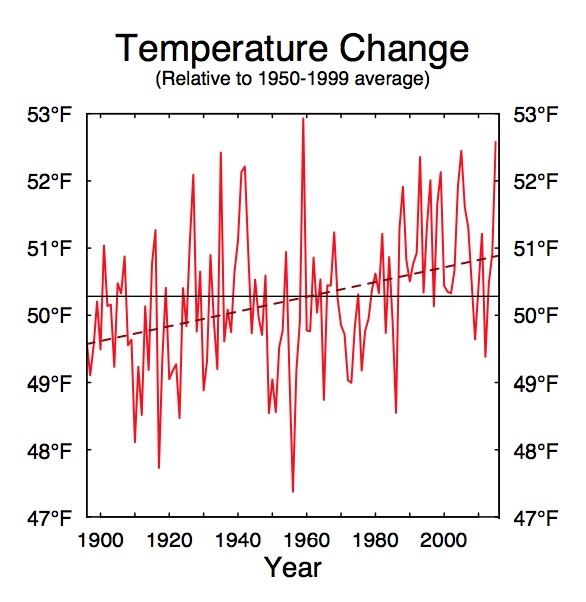 Temperature change is represented as the distance from a “zero” circle starting in 1850. Each month, a line moves one-twelfth of the way around the circle, completing 360 degrees each year. The line gets farther and farther from the center and really jumps outward in 2015. Ed Hawkins, professor of meteorology at the University of Reading near London, created the animation. He credited an associate, Jan Fuglestvedt, with the idea of a spiral. Jason Samenow, chief meteorologist for the Washington Post’s Capital Weather Gang, called it “the most compelling global warming visualization ever made.” His blog post also includes some other visual depictions of climate change. Another animated graph, by Tom Randall and Blacki Migliozzi of Bloomberg, show similar data depicted as a moving line graph. 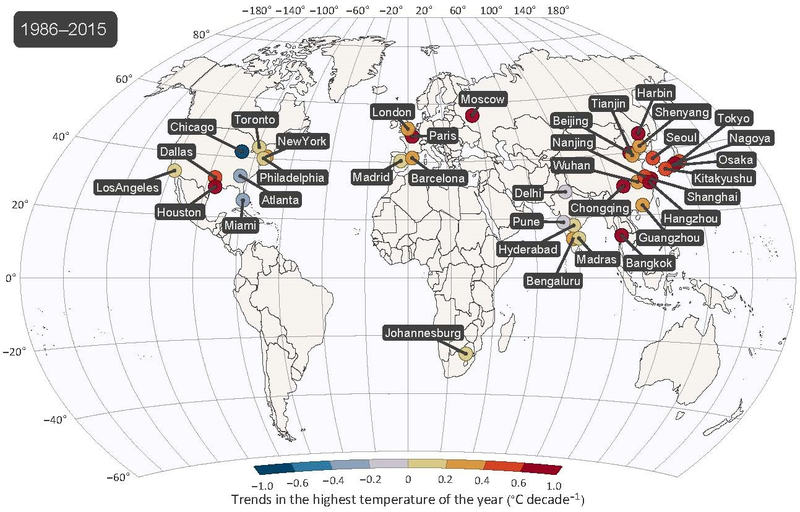 NOAA Visualizations plotted temperature differences at various locations on a world map. Over time, it is easy to see how the Earth has gotten generally warmer, accelerating in recent years. One of the most intriguing graphics, in my opinion, is one that purports to show the various factors that affect global temperature — from volcanic activity to man-made aerosols to greenhouse gases. The designers, Eric Roston and Blacki Migliozzi of Bloomberg, ask viewers to judge which factor they believe leads to global warming. Since this is a blog about water issues, I would probably be remiss if I didn’t point out that the consequences of rising greenhouse gases is not just an increase in the Earth’s temperature. We can’t forget that a major portion of the carbon dioxide is being absorbed into the ocean, causing effects on marine life that are far from fully understood. I’ve been going through the new report about climate change in the Puget Sound region, and I can tell you that the most optimistic chapter is the one on farming. Check out the story I wrote for the Encyclopedia of Puget Sound. To be sure, farmers will have plenty of problems to contend with. Rising sea levels and more intense rainstorms will probably causing flooding and seawater intrusion where it has never been seen before. Some of today’s farmland could become unsuitable for agriculture, and drier summers will force much better management of limited water supplies. But as the climate undergoes change, farmers can change with the climate, growing crops suitable for the conditions they face, said Kelly McLain, senior natural resources scientist with the Washington Department of Agriculture. It’s hard to find that kind of optimism anywhere else when it comes to climate change in the Puget Sound region. The story I wrote to accompany last week’s release of the new report discusses the likelihood that landslides will increase because of more intense rainfall patterns. See “Shifting ground: Climate change may increase the risk of landslides” and the Water Ways post on Nov. 19. My third and final story in the series, which will be published next week, talks about coming changes in habitats — and thus species — expected in Puget Sound as air temperatures increase, sea levels rise, rainstorms grow more intense and oceans undergo acidification. Total annual precipitation does not appear to be changing in the Puget Sound region. I took on this writing project as part of my work for the Puget Sound Institute, which publishes the Encyclopedia of Puget Sound. PSI commissioned the climate report with funding from federal and state governments. The Climate Impacts Group at the University of Washington compiled the best scientific knowledge into a very readable report, which can be found on the encyclopedia’s website or on the website of the Climate Impacts Group. One interesting chapter of the report, called “How is Puget Sound’s Climate Changing?” (3 mb) supports the understanding that climate change is not something we need to wait for. It’s something that scientists can measure now, although climatologists expect the changes to come faster as atmospheric carbon dioxide levels increase. Average air temperatures have been increasing in the Puget Sound lowlands and are currently about 1.3 degrees higher than in 1895. Higher temperatures have been found to be statistically significant for all seasons except spring, with the overall increase shown in a range between 0.7 to 1.9 degrees F.
Nighttime air temperatures have been rising faster than daytime temperatures. Nighttime lows have been increasing by about 1.8 degrees since 1895, while daytime highs have been increasing by about 0.8 degrees. The frost-free season has lengthened by about 30 days (range 18-41 days) since 1920. As in other areas, short-term trends can differ substantially from long-term trends. Cooling observed from 2000-2011, for example, has not altered the long-term temperature increase. An ongoing debate questions how much, if any, of the long-term warming trend is a result of natural climate variability. One study says up to 80 percent may be natural, caused by atmospheric circulation, not by greenhouse gas buildup. Other researchers have been unable to replicate the findings for other data sets. 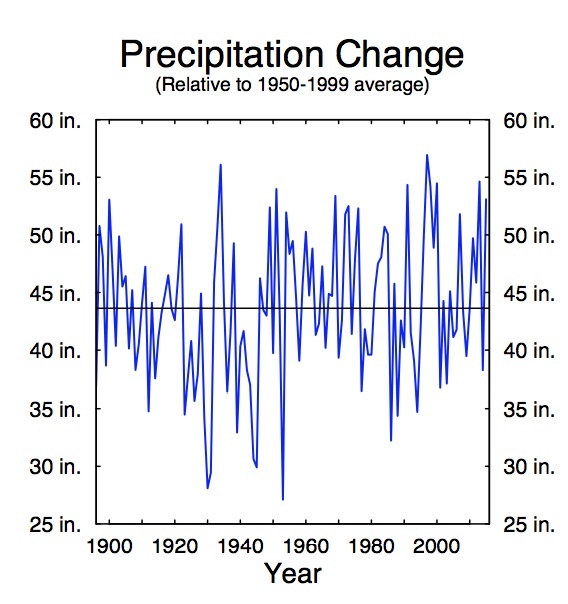 Total annual precipitation does not appear to be increasing or decreasing over a long time scale. Spring precipitation has increased at a statistically valid 27 percent for the months March through May. Most studies are finding modest increases in the frequency and intensity of heavy precipitation compared to historical levels, but results depend on the time period and methods of analysis. Ongoing variability in weather patterns related to El Nino and the Pacific decadal oscillation will continue to strongly influence temperature and precipitation for relatively short periods. It is not clear how long-term climate change will interact with these more variable climate patterns.